Mexico is a compatible environment for any industrial business considering the benefits of expanding to Mexico. Electronics, furniture and HVAC manufacturers all have a presence in the country and can take advantage of the many offshoring advantages of manufacturing there. However, there are three key industries that have been largely responsible for the explosion of manufacturing growth in the country: Automotive, aerospace and medical device manufacturing. Automotive manufacturing has led the way in Mexico over the past 10 years. Manufacturers from Canada, the U.S. and China have all chosen Mexico as the ideal location to produce both products and parts. According to Manufacturing.net,more than $23 billion in auto company investment has entered the Mexican market in the past decade. 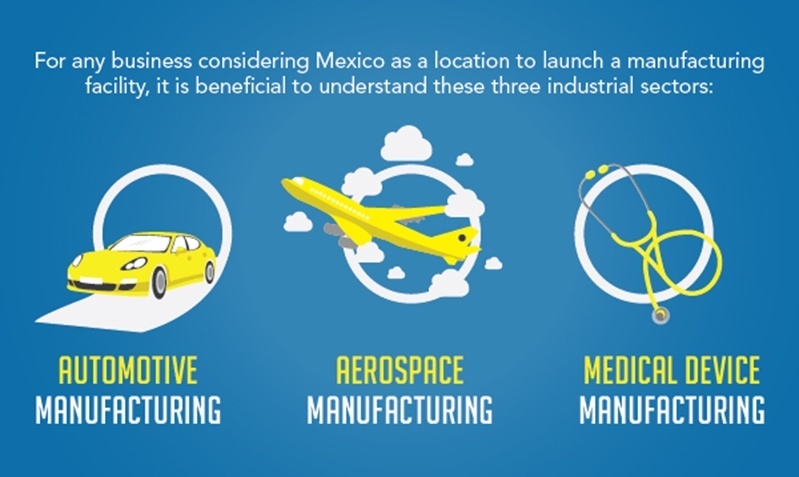 Automotive, aerospace and medical device manufacturing are three major industries in Mexico. One of the reasons auto companies have moved to the country is its location. Not only is Mexico close to the U.S., its western ports allow OEM manufacturers and Tier 1 and Tier 2 suppliers to export goods to Asia, Australia and New Zealand. As a result, Mexico provides a desirable supply-chain solution for manufacturing countries across the world. World Finance cited data from the Mexican Automobile Industry Association that revealed 70 percent of vehicles produced in Mexico are exported to the U.S. Many Chinese automakers moved their production to Mexico in order to deliver their products to high-end markets more efficiently. Further, Mexico's participation in the North American Free Trade Agreement and 44 free-trade agreements make the country a prime location for the auto industry. Sean McAlinden, vice president for research and chief economist at the Centre for Auto told World Finance that a $60,000 Audi Q5 shipped from the U.S. to Europe would cost $6,000 in tariff fees. On the other hand, exporting the same car from Mexico would cost the manufacturer $0 due to the country's free-trade agreement with Europe. As World Finance pointed out, exportability is the backbone of Mexico's car industry. Today, auto manufacturers continue to expand into or move their operations entirely to Mexico. For example, Fiat Chrysler announced plans in September to shift a large portion of its car production to Mexico, according to USA Today. Parts suppliers are also tapping into the country's thriving sector. Gentherm, a global developer of thermal management technology that supplies the automotive industry, shared plans to expand its production capacity to the city of Celaya in the state of Guanajuato, Mexico. The aerospace industry is another important component of Mexico's booming manufacturing sector. According to a report by PWC, in the past five years, the Gross Domestic Product of the aerospace and defense industry grew more than 20 percent each year. Further, due to the countries open trade policies, the industry brought a total of $3,183.7 million to Mexico between 1999 and 2014. The Mexican government has taken great strides to ensure the country maintains its position as a highly desirable location for aerospace manufacturers. For example, PWC cited the Pro-Aereo 2012- 2020, which was developed and carried out as a guide to the industry, with the goal of making Mexico among the top 10 suppliers in the aerospace industry worldwide. According to Aviation Week, the draw to Mexico from aerospace manufacturers goes far beyond the low cost of labor offered there. More specifically, the aerospace influx began in the 1970s when U.S. companies began sending their parts manufacturing operations into the country. In the past decade, the industry has grown tremendously due to political reform that welcomed its participation in NAFTA as well as its highly advantageous Maquiladora factory system that gives businesses greater control over highly expensive aerospace manufacturing parts. "The draw to Mexico from aerospace manufacturers goes far beyond the low cost of labor offered there." Americas Quarterly also pointed out another key reason why aerospace manufacturing has grown in Mexico is its increasing number of college graduates with degrees in engineering. The Mexican government has made investing in education a priority, and highly-skilled workers make manufacturing there feasible and beneficial. Aerospace manufacturing in Mexico is unlikely to slow down. In fact, Aerospace Manufacturing and Design reported Bell Helicopter recently held a grand opening of its new sales office based in Mexico City. Medical device manufacturing is another key component of Mexico's industrial sector. 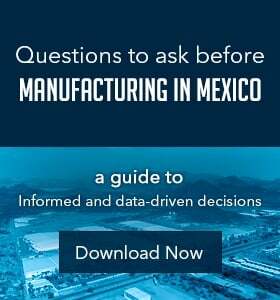 According to "Roadmap for the Medical Device Industry," which was developed by Mexico's Ministry of Economy, the Boston Consulting Group and ProMexico, Mexico is the fifth largest medical device exporter in the world, the second-largest market in Latin America and the leader supplier to the U.S. In 2010 alone, the sector reported exports totaling $5.798 billion and an average growth of 12 percent each year over a five-year period. The medical device manufacturing sector in Mexico is not slowing down. According to the BMI's "Mexico Medical Devices" report, there will be a compound annual growth rate of 13.8 percent in Mexico between 2013 and 2018, which will bring the medical device market to $6.9 billion by 2018. Flex, a medical manufacturing company that produces intelligent medical devices, is just one example of this continued growth. In October 2015, the company celebrated its grand opening of a new medical device manufacturing facility and Center of Excellence in Tijuana that employs 2,400 workers. Automotive, aerospace and medical device manufacturing are booming sectors in Mexico that have tapped into the country's many offshoring advantages. Manufacturers across all industries have the opportunity to tap into the benefits of doing business there.